Darjeeling tea is a tea grown in the Darjeeling district in West Bengal, India, and widely exported and known. It is processed as black, green, white and oolong tea. When properly brewed, it yields a thin-bodied, light-coloured infusion with a floral aroma. The flavour can include a tinge of astringent tannic characteristics and a musky spiciness sometimes described as "muscatel". Unlike most Indian teas, Darjeeling tea is normally made from the small-leaved Chinese variety of Camellia sinensis var. sinensis, rather than the large-leaved Assam plant (C. sinensis var. assamica). Traditionally, Darjeeling tea is made as black tea; however, Darjeeling oolong and green teas are becoming more commonly produced and easier to find, and a growing number of estates are also producing white teas. After the enactment of Geographical Indications of Goods (Registration & Protection Act, 1999) in 2003, Darjeeling tea became the first Indian product to receive a GI tag, in 2004–05 through the Indian Patent Office. Production has long been affected by disagreements between management and labour. Tea planting in the Indian district of Darjeeling began in 1841 by Archibald Campbell, a civil surgeon of the Indian Medical Service. Campbell was transferred as superintendent of Darjeeling in 1839 from Kathmandu, Nepal. In 1841, he brought seeds of the Chinese tea plant (Camellia sinensis) from Kumaun and began to experiment with tea planting in Darjeeling. The British government also established tea nurseries during that period (1847). Commercial development began during the 1850s. In 1856, the Alubari tea garden was opened by the Kurseong and Darjeeling Tea company, followed by others. Logo of the Darjeeling Tea Association – the central portion is the actual certification mark. 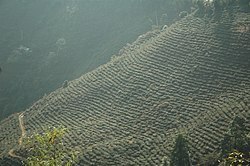 According to the Tea Board of India, "Darjeeling Tea" can only refer to tea that has been cultivated, grown, produced, manufactured and processed in tea gardens (see 'Tea Estates' section below) in the hilly areas of Sadar Subdivision, only hilly areas of Kalimpong Subdivision consisting of Samabeong Tea Estate, Ambiok Tea Estate, Mission Hill Tea Estate and Kumai Tea Estate, and Kurseong Subdivision excluding the areas in jurisdiction list 20, 21, 23, 24, 29, 31 and 33 comprising Siliguri subdivision of New Chumta Tea Estate, Simulbari and Marionbari Tea Estate of Kurseong Police Station in Kurseong Subdivision of the District of Darjeeling in the State of West Bengal, India grown on picturesque steep slopes up to 4000 ft (ca. 1200 m). When brewed, tea grown and processed in this area has a distinctive, naturally occurring aroma and taste, with light tea liquor; the infused leaf also has a distinctive fragrance. Adulteration and falsification are serious problems in the global tea trade; as of 2004, the amount of tea sold as Darjeeling worldwide every year exceeds 40,000 tonnes, while the annual tea production of Darjeeling itself is estimated at only 10,000 tonnes , including local consumption. To combat this situation, the Tea Board of India administers the Darjeeling certification mark and logo (see right). Protection of this tea designation is similar in scope to the protected designation of origin used by the EU for many European cheeses. According to the Tea Board, Darjeeling tea cannot be grown or manufactured anywhere else in the world, a labeling restriction similar to the E.U. protections for Champagne and Jamón ibérico. Traditionally, Darjeeling teas are classified as a type of black tea. However, the modern Darjeeling style employs a hard wither (35–40% remaining leaf weight after withering), which in turn causes an incomplete oxidation for many of the best teas of this designation, which technically makes them a form of oolong. Many Darjeeling teas also appear to be a blend of teas oxidized to levels of green, oolong, and black. The tea is hand-picked and rolled, then withered in the sun, making it a rare tea. It is grown in the rainy and cold climate of Darjeeling at altitudes up to 2000 metres. 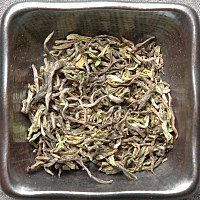 Darjeeling oolong is lighter than usual Darjeeling black tea during first flush, as it is semioxidized. The cup looks light orange and infusion remains green. Darjeeling oolong in second flush is more accepted worldwide. It is more thick in cup and dark orange in liquor with distinct muscatel flavours. The China type oolong has very rare muscatel flavour and sells somewhere around US$40–200 per kg. Clonal oolong has distinct flowery or spicy taste, so is not as well-accepted as Darjeeling oolong worldwide. Lower-elevation gardens can produce teas of similar appearance, but the flavour differs greatly from the main characteristics of oolong tea. 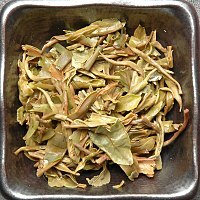 A green tea variant is produced by several estates in Darjeeling. Green tea is not fermented, but is steamed to stop oxidation starting, which preserves most of the polyphenols. It has 60% more antioxidant polyphenol content than black tea, and tastes less bitter. Polyphenols are claimed to help the body protect itself against free radicals, molecules, which occur in the environment and are naturally produced by the body, and can cause damage to cells. Chronic damage by free radicals is one factor thought to contribute to the development of many chronic diseases including heart disease or cancer. Polyphenols scavenge cell-damaging free radicals, which are linked with cancer-causing genes and cause LDL cholesterol to form artery-clogging plaque. The polyphenols in tea possess 25 to 100 times the antioxidant potency of vitamins C and E. Antioxidants impair the ability of free radical cells to harm the molecules that make up our bodies. The following list of tea terms describes Darjeeling loose leaf teas in their raw, dry, or infused states. • Colour: A term relating to the hue on dry tea leaves. Each flush has its own particular characteristics. • First Flush Tea Leaves or Spring Tea as it is also commonly called has grayish-greenish hues. • Second flush tea leaves or the summer tea leaves has a purplish-brown shade. • Autumn Teas have blackish-brown hues. • Nose/Point: A term referred to the infused leaves for their fragrance which has subtle hints of flowers or fruits or Muscatel character or sometimes showing characteristics of transuding all three combined. • Stylish: A term used for referring to dry tea leaves which are wiry, neatly twisted and evenly sized. Darjeeling Tea Estate women tea pickers. Women form the majority of the tea pluckers. Darjeeling tea has been plagued by management-labour problems for several decades. Frequent lock-outs and low wages have been the chief sources of discontent among the tea garden workers. Tea estate managements have claimed that profits from tea estates have diminished over the years, but have been reluctant to make public their revenue figures, and there has been severe criticism of the tea garden owners and the exploitation of the tea garden workers. From June 2017 there were violent protests and prolonged strikes supporting a campaign for a separate state for the area's majority Nepali-speaking Gorkha people. Production stopped after a third of crop had been harvested, causing financial difficulties and shortage. ^ "GI tag: TN trails Karnataka with 18 products". The Times of India. 29 August 2010. ^ a b Mair, Victor H.; Hoh, Erling (2009). The True History of Tea. Thames & Hudson. ISBN 978-0-500-25146-1. ^ a b "Darjeeling Tea History and extensive info". Thunderbolt Tea Darjeeling. ^ "Facts of Darjeeling tea". Indian Teaboard. ^ Kenny, Gadi (July 2004). "Darjeeling Tea – Intellectual Property Rights of Darjeeling Tea in the age of globalization and world trade". Trade & Environment Database (TED) Journal. American University (752). Retrieved 19 January 2012. ^ "Tea Emporium – 'Authentic Darjeeling tea at your Click!'". teaemporium.net. Retrieved 17 February 2014. ^ "The brew darkens". The Hindu Business Line. Retrieved 9 June 2015. ^ "Wage hike cry by hill, plains tea unions". The Telegraph. Retrieved 9 June 2015. ^ Soutik Biswas (5 August 2017). "Why you could soon be missing your cup of Darjeeling tea". BBC News. Retrieved 11 September 2018. This page was last edited on 8 April 2019, at 05:19 (UTC).